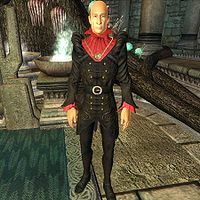 Haskill, who appears as a Breton, is the Chamberlain of Sheogorath. He is the first to greet you when you travel to the Shivering Isles. It is possible to summon him with a lesser power acquired after speaking to Sheogorath for the second time. He generally has some useful information regarding quests during the main quest line. He is also un-attackable - weapons and spells pass straight through him. He wears a unique suit called "Haskill's Suit", which can never be acquired by the player since Haskill is invincible and the clothing is not playable anyway. He knows a powerful healing spell unique to him that restores 300 points of health. While Haskill cannot be attacked or take damage he will however flee if danger is nearby. The only thing Haskill can be harmed by seems to be damage coming from the environment; i.e, if he is summoned underneath a falling rocks trap he will be hurt by the falling rocks. He is voiced by Jeff Baker, who voiced the male Dunmer and Imperials in Morrowind. It seems that the default dialogue for when you are a vampire overwrites any unique dialogue from Haskill. Instead you will hear the various default comments in the generic Breton voice (instead of Jeff Baker's voice). His personality is unique among the Shivering Isles. He displays none of the typical personality traits of Mania or Dementia and is a rare NPC who never declares allegiance to either (although in several lines of dialogue he shows a certain bias in favor of Dementia). He has a rather melancholy, subtly annoyed, and usually sarcastic attitude towards his position. In Bethesda's Interview With Two Denizens of the Shivering Isles he states that he has served his master since "the beginning" and never visited Tamriel. Taken along with his undisguised dislike of mortals, his status as an actual Breton rather than some other creature is uncertain. As with numerous other NPCs, Haskill doesn't employ the principles required to partake in the Speechcraft minigame. Haskill also appears as a character in the story expansion Isle of Madness for Legends, and as a card. All the Shivering Isles Main Quests. Haskill is also involved in Sheogorath's Daedric Shrine Quest if you complete Shivering Isles before doing the quest. A Door in Niben Bay: Cross the threshold of Madness. Through the Fringe of Madness: Get past the Gates of Madness. The Cold Flame of Agnon: Choose sides in the battle at Cylarne to relight the hope of New Sheoth. Retaking The Fringe: Defend The Fringe and stop the attackers. Rebuilding the Gatekeeper: Find all of the parts of the Gatekeeper and rebuild it. Symbols of Office: Procure the two items needed to craft the Staff of Sheogorath. The Prince of Madness: End the Greymarch; get your rewards. Occasionally, Haskill will not talk or respond in any way. To fix him, simply use Summon Haskill, which will reset him back to normal. If the player is 100% Vampire, Haskill will at times refuse to talk to the player. This cannot be circumvented, because the Charm spell will not work on Haskill, as he is set to Ghost state. Haskill will speak in a normal Breton voice if he is damaged in any way, for example, if you summon him and he takes fall damage. After completing the quest Baiting the Trap, you are given the ability to summon Haskill. During this time, he has many interesting things to say, if you keep summoning him. Ah...our Lord has granted you the power to summon me. How wonderful for me. Ah, summoned again. My lord does so enjoy that, as is His prerogative. I'll assume you're done for now. Yes, you've gotten rather proficient with your new ability. As I said, try not to abuse your power. Have we not covered this? I believe you've mastered your new skill. I was right there. You could have just walked over to me. I assume you're having fun? Might we stop this now? Surely, you have something better to do. Well done. Summoned again. I applaud you. What a surprise. I'm summoned. Your skill in repetition is truly astounding. Clever, You've summoned me again. My Lord has made quite a choice for his champion. This page was last modified on 11 March 2019, at 21:37.